From a small corner of my home and heart I would like to wish all of you out there a fabulous weekend. I got some new fabric a couple weeks ago. I am pretty sure none of you have seen this fabric anywhere;-)...seriously though I know the fabric has gotten some play in the blog world but I am still not sick if it..phew. To see more on this type of fabric go here. Just so you know there is a benefit to having somebody recruiting one to make a bridal bouquet because of all the extra flowers. At least there were some extras in my case. Fresh flowers do something for the soul. P.S. - The below pictures are on observation of one floral arrangement. Apparently I should just go ahead and marry my floral arrangement. P.S.S. - On a more serious note my heart goes out to those suffering in Japan. Seriously, can I live in this corner? LOVE it. Agreed! I can't live w/o fresh flowers, to the extent I will cut down things in my own yard if I don't have any in my house. Simply gorgeous. 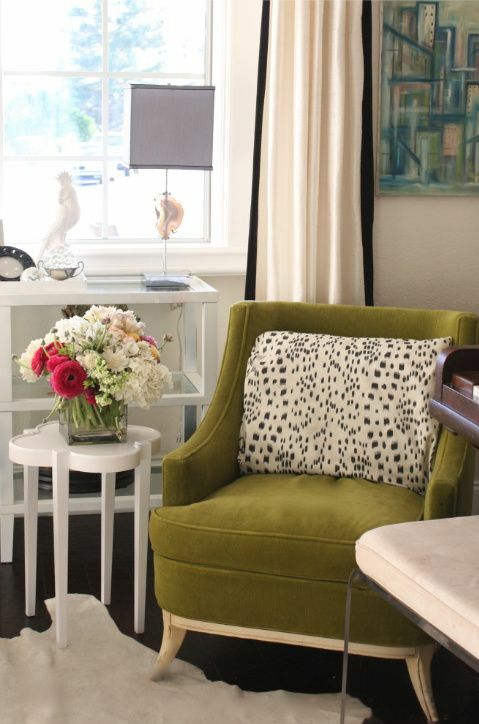 Love the printed fabric with the killer green on your chairs. Happy weekend! I want (we want IM sure) a full tour Christina! Thank you, because your corner just totally solved my furniture arrangement crisis du jour! Oh my. I could stare at that corner of your home FOREVER! And those flowers?! Killer. I'd love to cozy into one of your chairs with a cup of peppermint tea. Absolutely gorgeous! How very beautiful! I love the layered yet clean and comfy glamour -- gorgeous! 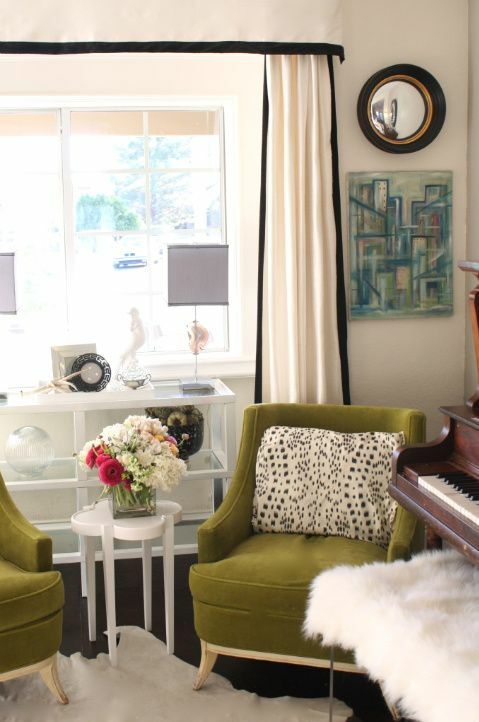 This little corner of your home is adorable and eclectic. Just beautiful and so is your flower arrangement. You have such a great sense of style! May I ask where you got those adorable chairs? what model of Vitamix do you have? these pictures look straight out of Lonny. You have a GORGEOUS home! Yes, a full house "pun fully intended" tour is a must Christina. This corner is beautiful as are the floral arrangements. A beautiful corner! And gorgeous flowers are a necessary indulgence for me. Makes a girl happy, right? You got it going on! love everything. love the pillow. did you read that post jenny did about blogs making us over exposed to design? I 110% agree. Oh, Christina! What a fabulous corner! Pretty sure I'll never get sick of that fabric. :) And those flowers! Soooooooooo pretty! Love your corner and your dalmation pillow (or whatever it's called.) I'm liking those spots more and more. Ah that corner is just dreamy- NEED to see more!!! I have been obsessed with that fabric for some time and feel I simply must own some- so good. And your flowers...and the whole space- gorgeous! !